Understanding the physical symptoms of panic attacks is key to overcoming the problem. It's vital to understand the physical symptoms of panic attacks, a subject I examine in last week's Southern Star column. The text is reproduced below. 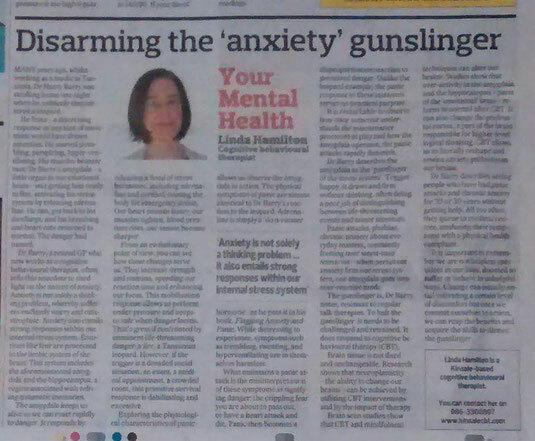 The article can also be read on the Star's website at http://www.southernstar.ie/life/roundup/articles/2017/02/24/4135251-disarming-the-anxiety-gunslinger/. Many years ago, whilst working as a medic in Tanzania, Dr Harry Barry was strolling home one night when he suddenly encountered a leopard. He froze – a discerning response as any hint of movement would have drawn attention. He started trembling, perspiring, hyper-ventilating. His muscles became taut. Dr Barry’s amygdala – a little organ in our emotional brain – was getting him ready to flee, activating his stress system by releasing adrenaline. He ran, got back to his dwellings, and his breathing and heart-rate returned to normal. The danger had passed. The amygdala keeps us alive so we can react rapidly to danger. It responds by releasing a flood of stress hormones, including adrenaline and cortisol, rousing the body for emergency action. Our heart pounds faster, our muscles tighten, blood pressure rises, our senses become sharper. From an evolutionary point of view, you can see how these changes serve us. They increase strength and stamina, speeding our reaction time and enhancing our focus. This mobilisation response allows us perform under pressure and keeps us safe when danger looms. That’s great if confronted by imminent life-threatening danger; a fire, a Tanzanian leopard. However, if the trigger is a dreaded social situation, an exam, a medical appointment, a crowded room, this primitive survival response is debilitating and excessive. Exploring the physiological characteristics of panic allows us observe the amygdala in action. The physical symptoms of panic are almost identical to Dr Barry’s reaction to the leopard. Adrenaline is simply a 'do-a-runner hormone', as he puts it in his book, Flagging Anxiety and Panic. While distressing to experience, symptoms such as trembling, sweating, and hyperventilating are in themselves harmless. What maintains a panic attack is the misinterpretation of these symptoms as signifying danger; the crippling fear you are about to pass out, or have a heart attack and die. Panic then becomes a disproportionate reaction to perceived danger. Unlike the leopard example, the panic response in these instances serves no practical purpose. It is remarkable to observe how once someone understands the maintenance processes at play and how the amygdala operates, the panic attacks rapidly diminish. Dr Barry describes the amygdala as the ‘gunslinger of the stress system’. Trigger-happy, it draws and fires without thinking, often doing a poor job of distinguishing between life-threatening events and minor stressors. Panic attacks, phobias, chronic anxiety about everyday matters, constantly fretting over worst-case scenarios – when persistent anxiety fires our stress system, our amygdala goes into over-reactive mode. The gunslinger is, Dr Barry notes, resistant to regular talk therapies. To halt the gunslinger, it needs to be challenged and retrained. It does respond to cognitive behavioural therapy (CBT). Brain tissue is not fixed and unchangeable. Research shows that neuroplasticity – the ability to change our brains – can be achieved by utilising CBT interventions and by the impact of therapy. Brain scan studies show that CBT and mindfulness techniques can alter our brains. Studies show that over-activity in the amygdala and the hippocampus – parts of the “emotional” brain – returns to normal after CBT. It can also change the prefrontal cortex, a part of the brain responsible for higher-level logical thinking. CBT allows us to literally reshape and rewire anxiety pathways in our brains. Dr Barry describes seeing people who have had panic attacks and chronic anxiety for 20 or 30 years without getting help. All too often, they queue in medical centres, confusing their symptoms with a physical health complaint. It is important to remember we are not helpless spectators in our lives, doomed to suffer or behave in unhelpful ways. Change can initially entail tolerating a certain level of discomfort but once we commit ourselves to action, we can reap the benefits and acquire the skills to silence the gunslinger.